For now let me share the reason I'm most excited for the Big Apple: MUJI! 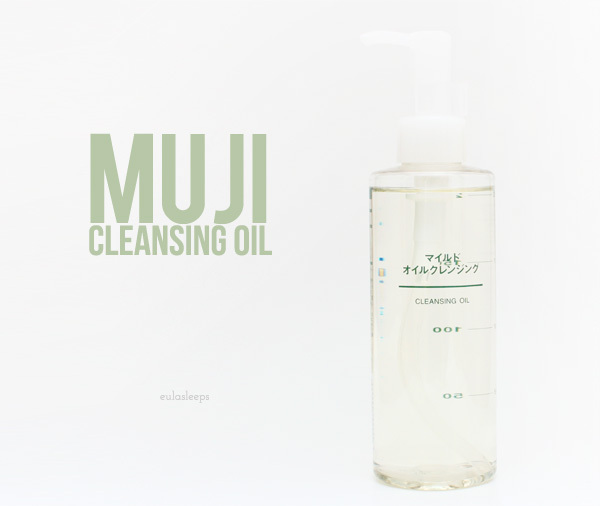 Yes, I've gone months without the Muji Cleansing Oil I love so much. I've tried other oils from Boscia and Shu Uemura, but this remains my favorite. Read on to find out why. You probably already know this, but for those of you who don't, here's a recap of how to use cleansing oils. Dispense one or two pumps on your palm. Rubs your palms together to warm and spread the cleansing oil. Gently massage the cleansing oil all over your DRY face. Dampen your hands (they shouldn't be soaking wet) with tepid water and run them over your face to emulsify the oil. It will turn milky! Rinse off the cleansing oil completely. Here's a video the the Shu Uemura team. Though four pumps is a bit much, lol. 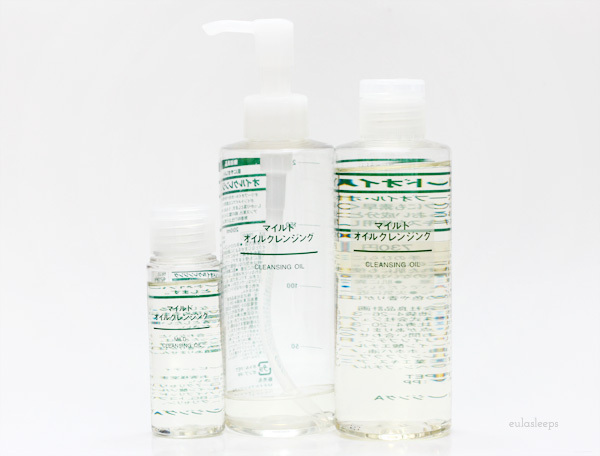 From the different types of makeup removers I've tried -- cream, foaming, milk -- cleansing oils are the best at removing every bit of foundation with one go. These oils are best suited to oily or combination-oily skin. Oil for oily skin -- it makes sense, like like dissolving like. I love the Muji one because so far it's the only one who can remove all traces of makeup -- even waterproof face bases, even K Palette's 24hr One-Day Tattoo Eyeliner -- except waterproof mascara. It runs thinner than other oils, which I think helps in this regard. The consistency also makes it easier to spread and emulsify. One full pump is enough for my face; I add half a pump for my neck. 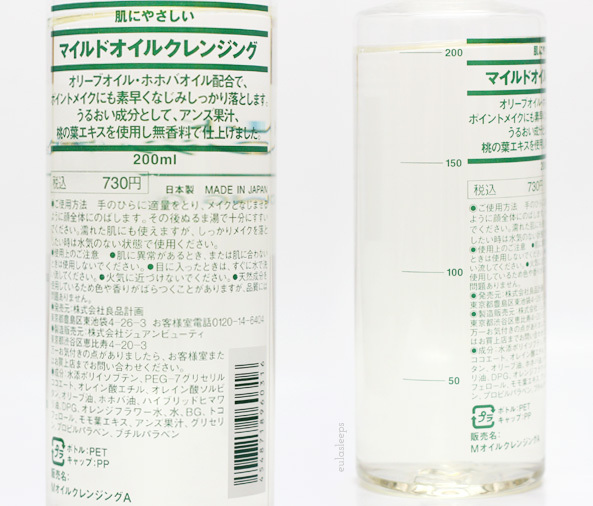 A 200-ml bottle lasts me 4-6 months, even if I use it as a daily in place of a cleanser. It's unscented but it doesn't smell like cooking oil, unlike other unscented oils. Just watching it turn milky before rinsing away makes my face feel so much cleaner. And it doesn't leave your skin feeling tight, nor does it leave a greasy residue. I've read that cleansing oils may be too harsh for those with dry skin; cleansing milk being the better choice; but haven't heard this complaint from anyone. Also, how much do you love that the packaging is simple but functional? Classic Muji. It also comes in a 50 ml travel size! Both full sizes and travel size can come with out without a pump. Basic, unscented cleansing oil that removes makeup impressively well. Can be used as a daily cleanser. One bottle lasts a LONG time. 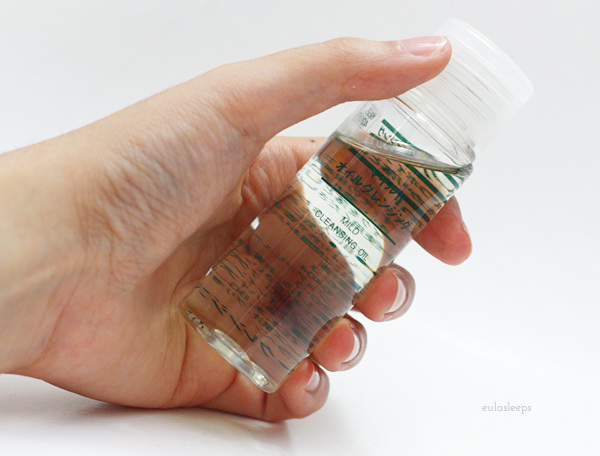 Muji Cleansing Oil retails for Php 425 for a 200 ml bottle.